My research job is part of the Individualised Diagnostics and Rehabilitation of Attention (INDIREA) network, which is supported by a Marie Curie grant from the European Union. The network investigates different patient groups (mostly stroke and ADHD), and aims to come up with advanced diagnostic tools and rehabilitation methods. Although ADHD, psychopathy, and several stroke-related conditions are relatively well described in diagnostic manuals (such as DSM, or ICD), they are primarily defined by their symptoms. That is: the behaviours and complaints that are common in patients suffering from a condition. These are not necessarily the same behaviours and complaints that cause people to turn into patients, though! A simple example to illustrate this: Imagine you have a cold. Common symptoms include a runny nose, but not fever and nausea (those are associated with the flu). Doctors can use your symptoms to differentiate between different groups of patients, for example those with a common cold (with runny noses) and those with the flu (with runny noses, but also with fever and nausea). So knowledge on what symptoms are associated with what condition is very useful for diagnostics. For treatment, however, it is important to look beyond a condition’s symptoms. Your cold is not caused by a runny nose; quite the opposite! Your cold is caused by a virus, and the runny nose is caused by your body responding to that virus. If you only treat the runny nose, you leave the virus untreated, and allow it to keep making you sick. Don’t worry if you have a cold, though: your body should be perfectly capable of dealing with it. Mental health issues are a different story. If you suffer from ADHD, for example, your symptoms probably include hyperactivity. You can take medication that will reduce this hyperactivity, but it will not remove your ADHD. Stop taking your pills, and you will be hyperactive again. In addition, you are likely to have attentional deficits: difficulty with sustaining your attention on one thing, and being easily distracted. Ideally, you would like a treatment that removes the ADHD altogether. Unfortunately, ADHD is far too complex to simply ‘remove’. In addition, it’s a very diffuse condition: one individual’s ADHD might not have the same cause as another individual’s, even if they have similar symptoms. And one individual with ADHD might have very different symptoms and problems than another, even though they might both fulfil the official criteria for ADHD. Unfortunately, this is true for most mental health conditions, including psychopathy and stroke-related conditions. Defining mental health conditions by their shared symptoms is like trying to figure out what’s wrong with your car by looking at it, and listening to the noise it produces. This might give you some idea of what’s wrong, but you will have a better idea of the problem if you look under the hood. You need knowledge of the basic building blocks of your car, then look at which of those building blocks is not working as it’s supposed to, and fix that block. You might argue that human behaviour is more complicated than a car, but I think we can recognise very basic building blocks that build up to complex behaviour. Because my work focuses on attention and working memory, I will illustrate the idea of building blocks of complex behaviour in this context. 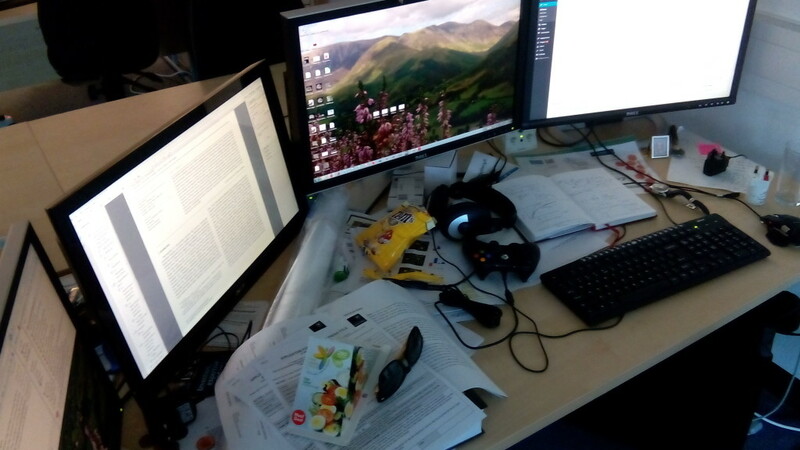 Think of my desk: a messy collection of personal items (wallet, phone, keys), research papers, notes, tech stuff, and food. When I leave my desk, I need my keys to lock the door. At this point, finding them becomes quite a complex task that requires me to: 1) Be able to see, 2) Be able to systematically scan my desk, 3) Recognise my keys, and 4) Coordinate my eye and hand movements to reach for them. The first is obvious: if you’re blind, visual search is going to be very hard. The second, being able to systematically scan my desk, can be further subdivided into smaller building blocks. Firstly, I must be able to compose a strategy to search my desk. This can be a highly organised scanning pattern, or by randomly looking around. Furthermore, in order to make eye movements that might land on my keys, I must be able to keep myself from making eye movements to other things on my desk. This includes being able to prevent myself from looking at the candy on my desk, and stuffing my face with it. By now, it should be clear that when searching for my keys, I’m actually combining a lot of small steps, while inhibiting the small steps I shouldn’t make. These steps are the building blocks of behaviour. My desk: Can you help me find my keys? Different patient groups will not be able to effectively do a visual search for their keys. For example, patients with visual agnosia will not be able to recognise the keys. Certain patients with damage to frontal cortex might find that their attention is grasped by the candy and not by a set of keys. Individuals with ADHD might have trouble sustaining their attention on the task at hand (finding the keys), and get distracted by a printout of some cool new research paper. Each of these patient groups will also have trouble with tasks other than visual search, if these include the building blocks that they have issues with. Investigating and discovering which building blocks patients have issues with, is what micro-diagnosis is all about (I’m coining that term now; please shout at me if it already has a different meaning!). By developing tests that can selectively target one building block of behaviour at a time, we can map out what the underlying issues of a patient’s condition are. By then addressing an impaired building block in rehabilitation, we could help a patient improve on all tasks that require it. In this way, we can treat every single patients as an individual with certain issues, rather than as a stereotypical patient with disorder X. Helping a patient with trouble ignoring items on my desk that are not relevant to help find my keys, whether it’s due to ADHD or frontal brain damage, will not only improve their ability to find my keys. It will also help them in other situations where inhibiting task-irrelevant information is required, such as reading, watching television, or pretending to work while being asked to help do the dishes. So rehabilitating behavioural building blocks is more efficient that rehabilitating one task at a time. In order to uncover what building blocks make up certain behaviour, it is important to test neurologically healthy individuals. These are the people that are able to find the keyring in the photo above (I’m not saying that you have brain damage if you can’t find it, but you just might…). Studying healthy individuals, provides us with knowledge on how human attention and working memory that is vital in understanding what could be wrong with patients and their brains. Fundamental research teaches us what the basic building blocks of behaviour are. Without it, we would have little understanding of the causes underlying mental health issues. So next time you hear someone say that fundamental research is useless, give them a filthy look and/or a piece of your mind. The work on psychopaths described in another post (despite being funded primarily through other sources) and most of my other work fits in very nicely with the INDIREA concept. In our network we try to map out the underlying mechanisms (the building blocks) in attentional disorders, we try to develop tools that can diagnose problems with these underlying mechanisms in patients, and we try to develop rehabilitation programmes that can help patients improve the underlying mechanisms that they have trouble with. For more information, please refer to the INDIREA website. And keep a close eye on this blog, where I will update you on related research findings. ADHD, diagnosis, mental health care, neuropsychology, rehabilitation, stroke. Bookmark. This is exactly what I have been discussing with my wife, she a Public School 4th grade educator with a late developed love of technology in the classroom and me an EE with ADD, and having a son struggling through engineering at Uni with ADD! In particular I knew there had to be a relatively easy way to set up an eye tracking AP – that could be effective at quantifying ADD related issues. Both statistically across the population and for the individual diagnosis, and furthermore quantify the effects of various treatments. The ability to track time on task, time to re-focus, subject mater attentiveness – etc, has to be very powerful. Do you have any “customers” – I know it is open source, that are doing research on this? The benefit of having an AP that can be used effectively on a standard laptop, locally would be huge, and we would love to help out with input, feedback, and usability, trials. This is an important issue to me (us). Please feel free to pass my contact info along as you think is appropriate. Oh — nice website too, well laid out and informative!